During a trip to St. Lucia, many visitors opt to try all the fresh seafood they can get. The menus at Marigot Bay Resort & Marina do not disappoint in this department. 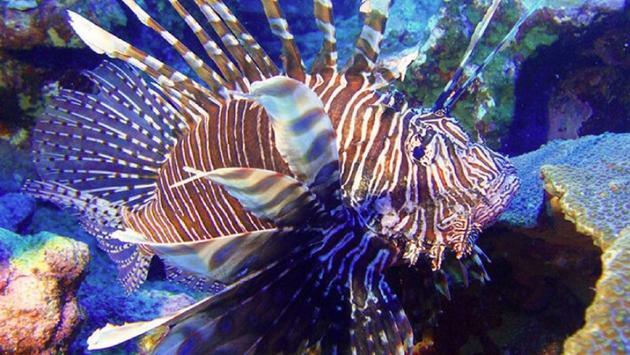 However, in recent years there has been a collective concern regarding a beautiful but harmful invader, the Lionfish. This species of fish is said to not only be venomous but have very few predators. They can apparently consume up to 80 percent of an area’s reef fish within only five short weeks. As these fish made a strong appearance in the waters around St. Lucia, something had to be done. Consuming the Lionfish is one of the best solutions to the growing problem—the only issue is making sure they are being caught properly without disrupting the reefs. Since they live among the coral reefs, they should only be caught by divers with spear guns. The diving clubs and companies in St. Lucia have held lionfish derby days in the past to provide the tasty fish to local consumers. The Lionfish can be used in several meals including ceviche, sushi and even the classic fish and chips. There are no signs of these deadly invaders going anywhere—so keep an eye out for them on the menu during your visit to the island. Visit Marigot Bay’s blog to learn more about the dangerously delicious Lionfish. Marigot Bay Resort & Marina is a Caribbean resort in Saint Lucia that overlooks the beautiful Marigot Bay. This luxury resort offers stunning views and outstanding accommodations.